It’s been over a year since I last encouraged you to have a computer backup strategy in place, and some recent news made me want to emphasize this once again. More than ever, many of us store precious photos and documents on our computers, so taking the time to back them up properly is vital. The following stories illustrate just some of the reasons for having those backups. Hodge dashed into the building. He ran past the smoke and the firefighters yelling at him to stop and managed to grab the precious laptop. Hodge could have been seriously hurt, and his laptop could have been unsalvageable. Fortunately, everything worked out fine. But if he just had an offsite backup, he wouldn’t have felt compelled to take such a risk. Such failures are an ongoing risk computer users face every day, and backups mean we’re protected when they happen. In a flash all the files on my desktop disappeared and were replaced by the files from my work desktop. Anyone who has had an update go wrong can imagine how this would feel. Fortunately, Marshall had a good up-to-date backup and was able to restore all his files. Oakland-based photographer Jennifer Little had her home broken into last week, and her loss was devastating. In addition to stealing 8 of her cameras, the burglars also took 21 hard drives containing Little’s life’s work as a professional photographer. Our precious computer files are the opposite of clutter. 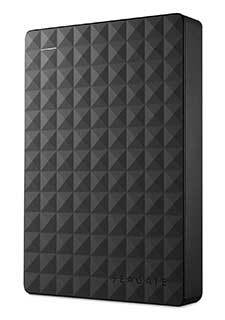 I would hate for any Unclutterer readers to lose any such files, so please take the time to create and implement a thoughtful backup strategy (if you haven’t already) that includes files on your computer and any files you’ve offloaded from your computer to external hard drives, thumb drives, CDs, or DVDs. As September gives way to October, we enter the heart of hurricane season. We’ve written about organizing your storm supplies before, and today I’ll focus on tech to help you weather a storm. If you haven’t organized your preparedness kit yet, there’s still time. When a storm hits, it’s important to receive information from authorities. The American Cross ZoneGuard Weather Radio is great for this. It finds and delivers alerts for your area, flashes color-coded warnings and tunes into AM, FM and NOAA digital radio stations. It runs off of AC power or AA batteries. 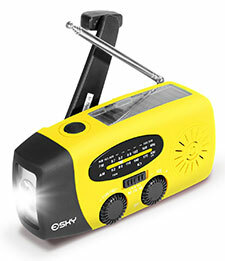 A good hand-crank radio is also great to have, like this one from Esky. Just 60 seconds of cranking 20 minutes of use. There’s a solar charing option as well, but stormy days aren’t usually very sunny. If you own a smartphone, you’ve got a tiny computer that can be tremendously useful in an emergency. When your home’s power goes out, Wi-Fi goes with it. So grab your phone and rely on cell connectivity. There are several great apps available, including The Red Cross, which offers apps specific to certain disasters, text alerts and first aid information. Of course, none of that matters when your phone’s battery dies. Keep it going with an Eton Boost Turbine. As you may have guessed, it’s a hand-crank charger for your phone and other USB devices. Just plug it in and get cranking. Of course, don’t forget a good old corded phone. When cell/internet service goes down, or when your your power goes out, a corded landline phone will let you call out. Finally, I have to identify my favorite flashlight of all time, the Coast HP1 Focusing 190 Lumen LED Flashlight. LED flashlights are brighter than those with traditional bulbs, and the HP1 shines a powerful beam indeed. It takes rechargeable batteries, is water resistant, impact resistant, compact and feels great. There’s a lot more you should do to prepare for a storm. Today we’ve pointed out a few bits of tech that you can rely on. We hope this was helpful. Be careful out there. You may need to hire help to do things you physically can’t do yourself. I had this situation when I first came home after my hip surgery and had many movement restrictions. I needed someone to come in weekly to do the laundry, vacuum the floors, and run some errands. You may need to hire help with specific expertise that you don’t have. For example, many people hire someone to do their tax returns. You may want to offload time-consuming tasks that you don’t enjoy to free up time for other things that are more important to you. And sometimes you may want to hire someone for more than one of these reasons. The only ongoing help I have is with my yard. My gardener knows much more about plant care than I do. She can readily climb a ladder to trim tall plants while that would make me uncomfortable. And I just don’t enjoy most gardening work and tend to put it off until it becomes problematic. How do you best go about hiring the help you need? The following are some suggestions. Make sure your expectations are as clear as possible. This will mean writing things down, spending time explaining things verbally, or both. All the things you do by second nature will need to be specified. For example, when I hired household help I had to tell the person how my washing machine worked, what settings I used, how much detergent I used, etc. Also determine what things you don’t care about. My home helper asked how I wanted my non-slip socks paired up and put away, and I told her to do it any way she liked. If you make tasks as easy as possible for your helper, things will go more smoothly. When I sent my helper grocery shopping (with a list that included brand names and package sizes), it helped when I could tell her where in the store things were located, especially those that weren’t obvious. I also made sure she had my cell phone number so she could send me a text if she had any questions. If someone is going to unload your dishwasher, put away laundry, or otherwise tidy up, you may want to label the cabinets and closets indicating what goes where. If someone is working on a project for you, make sure your communication expectations are clear. What kind of status updates do you want, and how often should they be provided? How quick of a response do you expect to calls, texts, or emails? When relevant, be sure you’re clear about what supplies you’ll provide vs. what supplies the helper will provide. If the helper is providing things like cleaning supplies, do you have any restrictions on what products are used? And be sure you’re clear about pricing and billing. If there’s an hourly or weekly rate, what’s included and what’s extra? Billing surprises are no fun for anyone! Sometimes you may not know the specifics of what you need done, since you are hiring help to fill in for your lack of expertise. But even then you probably have some expectations you can define. For example, my gardener knows that I need to keep all plants from touching my house to minimize the risk of termites. Nolo has a helpful article about hiring household help. As the article explains, you can hire a company, hire a worker through an agency, or hire an individual. I got my home helpers through a company, while I hired my gardener directly. And be sure you understand the legal aspects of your hiring decisions, including tax and insurance issues. Again, Nolo explains the basics, and you can consult a lawyer for more information. If you failed to specify some of your expectations (which can easily happen when you first set about hiring help) and now the work isn’t being done as you would like, talk with your helper about making changes. Sometimes just a tiny change can make a big difference. If the change is too significant and you realize you and your helper are a mismatch, you may want to find someone better suited to your redefined needs. An ongoing mismatch may well make both you and your helper miserable, so ending the relationship can be best for all concerned. Whenever you receive a new goodie, like a new phone or tablet, it’s an exciting time. But don’t just tear into the box! There’s an organized way to bring a new gadget into your life, and the following is advice for making that transition as smooth as possible. This might sound ridiculously obvious to you or it might seem just ridiculous. “Dave, it’s the box. Who cares?” There are several reasons to care, and the first is the gadget’s future resale value. I upgrade my iPhone every two years. I always sell my current model to help pay for the new one. Having the pristine original box helps with shipping and final asking price. Also, if you aggressively tear into a box, you could affect the contents. You don’t want to scratch a screen or case before you even turn on the device. Finally, think of returns. There’s always the possibility that your new doo-dad won’t work as advertised. A UPC code, the security tags, and intact contents are essential when trying to make a return. Take your time, keep things neat and store that box in a safe place if you might return or resell the item. If you’re not going to read it, at least skim the manual. Some gadgets come with a “quick start” guide. I always review those. Yes, you probably know how this works, but maybe not. Read/skim the manual and then store it in a safe place for future reference. I also recommend making a digital copy after some time has passed and if you’re not planning to return or resell the item. This is the step that nearly everyone skips. I always spend a few minutes registering my products, especially pricey electronics. It will make service easier should you need it someday. Additionally, if there’s an update or other notification that owners need, like a recall, you’re more likely to receive that information if your product has been registered. If your device charges up with a cable, buy an extra one. I keep one in my laptop bag at all times. You might bring an extra to work or simply keep it around for when the first one gets frayed or otherwise stops working. You might want to somehow identify it as your own. My kids love to steal iPhone cables, so I make sure we all know which is mine. Finally, scan the receipt and store it digitally in a place you can easily retrieve it if necessary. Now that all this preparation work has been handled, take the product out of the box and use it. Transfer data from your previous gadget and set up preferences. The following are five simple things you can do every day to stay on top of your clutter-free home. When my sisters and I were young, and our clothes or hair were a mess, my mother would tell us, “You look like an unmade bed.” Aside from looking messy, a bed piled with sheets and blankets is no fun to get into at night. It is, however, inviting to the dog, who will gladly deposit his fur on your sheets. Spending the three minutes it takes to make the bed will make things easier on the eyes and more pleasant at night, all while foiling the dog. You can always air out your sheets while you shower, and make the bed afterward if you’re worried about your sheets getting stagnate. Laundry can pile up very quickly. Miss a day and it feels like you’ve got a mountain on your hands. I’ve taken to putting a load in each morning and moving from washer to drier after work and folding it after dinner. It only takes a few minutes, and it keeps me from wasting an entire Saturday afternoon on conquering Mount Laundry. What piles up faster than laundry? The incessant onslaught of mail, papers, permission slips, advertisements, and so on that enter my home. Instead of piling it up in a heap, deal with it immediately (if possible). Keep a trash can, recycling bin, shredder, pen, and physical inbox in a convenient location to your main entrance so you get rid of the junk and trash immediately, and get the important paperwork identified and processed. If you adopt only one suggestion from this list, let it be this one. Each evening I ask, “What’s needed for tomorrow?” Kids lunches, umbrellas because it’s supposed to rain, gas in the car, permission form signed, what everyone is going to wear, etc. This allows me to avoid the last-minute scramble to do these things in the morning, teaches the kids to do the same, and lets me enjoy my evening knowing that nothing is going to blow up in the morning (probably). Let’s say on Monday you realize that the TV remote needs batteries, you’re almost out of toothpaste, and the car’s state inspection is due in 10 days. These all need to be taken care of, but they’re exactly the type of thing that will slip through the cracks of your memory if you don’t capture this information and get it on your to-do list or calendar. Have a reliable, simple way to collect these things — an app, a dry erase board on the refrigerator, whatever — that you can review. Then, the next time you’re in the car, you’ll know exactly where you need to go. Staying on top of these things is easy. Just take on a few simple new habits and you’ll notice your life moving in a smoother manner. Local man Marshall Platt, 34, came tantalizingly close to kicking back and having a good time while attending a friend’s barbeque last night before remembering each and every one of his professional and personal obligations, backyard sources confirmed. That could be a paper to-do list, a collection of sticky notes, a computer file, or a list within an app. You could create multiple lists (as the Getting Things Done methodology would promote) or a single list. But one way or another, have one or more lists that capture all those thoughts about obligations. Just creating a physical or digital list removes some of the stress — you no longer have to keep a mental list and worry about forgetting things — and it gives you a starting point for taking control of your situation and moving forward. Many of us, as we prepare for vacation, suddenly get very clear about what must be done now vs. what can be put off until later — and the quickest way to deal with things. In the case of the imaginary Marshall, paying the medical bill and doing laundry would jump to the top of the list. But some emails probably don’t need an immediate reply, and those that do need a reply can perhaps get by with a couple sentences rather than five paragraphs. Instead of making an after-work trip to Bed Bath and Beyond for linens (another part of that Onion scenario), maybe buying online would be quicker and less stressful. If looming project deadlines seem next to impossible to meet, talk with the appropriate people (your boss, your client, etc.) to develop a new plan. Maybe there’s some flexibility in those deadlines. Maybe the scope of the projects can be changed. Maybe someone else can take over some of your non-project tasks to give you more project time. I remember going into a panic at one of my first jobs because I had so much to do. My wise boss helped me determine what needed to be done first, and then he had me clear my desk of everything not related to that one task. And it worked! I went through my many tasks one at a time, in priority order, focused each time on a single task. And everything got done just fine. Taking time to go a friend’s barbeque can be just as important as other things on your list. And if you’ve created your to-do list, set priorities, and renegotiated deadlines as necessary, you should be able to truly enjoy some time just having fun. Transitioning to a new job can be stressful. There’s a new culture to adapt to, a new schedule, new routines, and the desire to demonstrate that you are, in fact, the right person for the job. 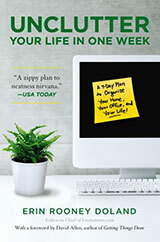 If you’re returning to the working world after an absence, the stresses are even greater. To keep your anxiety in check, let organizing help you. Whenever you start a new job, you receive a lot of information all at once. Numerous papers (maybe even binders) from the human resources department (retirement, vacation time, policies and procedures, etc.) and work-specific protocols (how to reserve a meeting room, where to take breaks) all hit you at once. If you’re working in an office setting, I recommend buying two binders ahead of time or acquire two hanging file folders. Label one binder or hanging file folder Policies and the other Benefits. Then, get dividers for the binder or manilla folders for subdivisions. Sort the papers you receive into the two categories major categories right away. Next, divide those two piles into reference materials and things that require action. The reference material can be safely stored in the appropriate binder, while the actionable forms (retirement, wellness policy, etc.) should be scheduled on your calendar for when to be completed and returned (you’ll likely want to make copies of these documents, too, to keep in your binder/file). Next, recognize that you probably don’t need to know all of that new information right now. Give yourself permission to read a little bit a day instead of all at once (feel free to schedule this reading time on your calendar, too). The last time I started a new job in an office setting, it was the first time I had worked outside of my home in many years. I had a lot of questions and a lot to learn. To keep track of it all, I carried around a small notebook. When I learned a new protocol that wasn’t covered in the official documentation, I jotted it down. Even simple things like where to park in the parking lot when it was snowing, how to fill out a help ticket with the IT department, etc. Eventually I had a portable database of answers to assist me in navigating this new experience. The benefits of my notebook extended beyond portability. For example, it cut down on the number of questions I had to ask. That’s always embarrassing as the new guy. Also, it let me record ideas that I wanted to share in a weekly meeting with my supervisor. The amount and type of personal stuff you can bring to work — reference books, photos, earphones, bobbleheads — depends on many factors, like the type of work you do, the setting, and the company’s policies. Another factor to consider here is the culture. Do your new co-workers decorate their workspaces? Are you in an office or out in the field? Take a week or so to get a feel for how that stuff is handled before considering what to do with your desk. Find a veteran at the company who can answer questions and help you navigate the daily grind who isn’t your boss or supervisor — a buddy to explain all the little stuff. Keep it casual and try not to overwhelm the person, too. Set expectations. Ask your supervisor for a weekly check-in meeting, at least for the first month. Be clear on the company’s dress code before your first day. A quick call to the human resources department will help you with this before you buy a new wardrobe or show up in a suit while everyone else is in jeans and t-shirts. Politely ask how people wish to be addressed. Does your boss wish to be called Bob or Mr. Barker? And, if you’re unsure as to how to pronounce a co-worker’s name, again politely ask for guidance and practice until you get it right. The last thing you want to do is be at a company for years and then learn you’ve said someone’s name wrong the entire time. Good luck! Starting a new job is exciting and with a little organization you can get past the initial anxiety quickly. Following up to Jeri’s post on Thursday, I want to point out a new Kickstarter project by Leo Babauta, the author of the popular website Zen Habits and one-time contributor to Unclutterer. 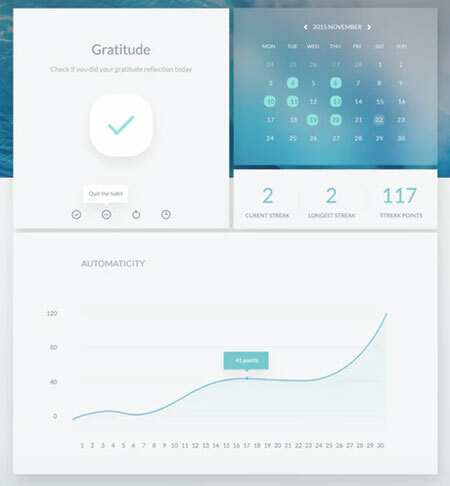 It’s a piece of software he’s calling Habit Zen, and it’s all about adopting positive, life-changing habits once and for all. We’ve written about the challenge of making habits stick several times. Leo’s project addresses the two issues that hinder progress most often: overcoming resistance and making new habits stick. How? Experiments. Leo describes what he calls “massive habit experiments,” including things like how many habits you can work on at once and the effectiveness of things like reminders and public accountability. As you discover the results of each experiment, you generate the “habit formula” that will help you adopt — and keep — those great new behaviors. It’s a clever, hands-on approach that I find compelling. For me, resistance is the biggest obstacle. I always find a reason to not get up a half-our earlier, make the kids’ lunches the night before, gas up the car, etc. I’m hoping Leo is on to something here. 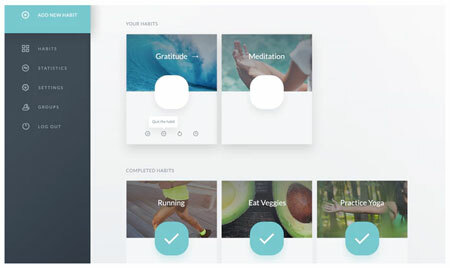 Consider backing Habit Zen, or at least taking a look at what he’s got going. As I recover from hip replacement surgery, the final thing I need to do is build up my strength and stamina, and my doctor recommended walking as the best way to do that. I used to walk 10,000 steps a day, but had given that up when medical issues arose. I wanted to get back into that habit, so I put the following strategies in place to ensure I was successful. I had been using a Fitbit, but I had kept having problems with the battery. A friend was using the Pedometer++ app on her iPhone, so I gave it a try, and it’s meeting my needs. Not all of my pants have pockets, which means I miss some steps because my phone isn’t with me. So I may go back to some sort of wearable, but for now the app is working okay for me. I couldn’t go from very limited activity to 10,000 steps all at once. Looking at how much I had been walking just going grocery shopping and such, I set my first goal at 4,000 steps per day — more than what I had been doing, but not so much of a stretch that it felt intimidating. Once I had my tool and set my goal, and then hit that goal for a number of days, I didn’t want to break my run of successful days. I really wanted to see my step count showing as a green bar (rather than red or orange), showing I’d made my goal. 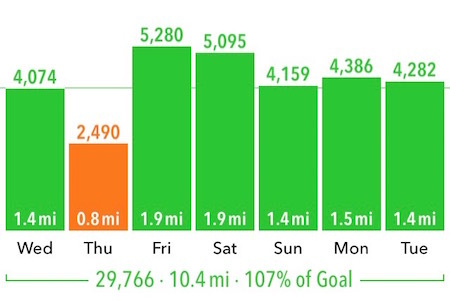 And if I had one low day, I tried to compensate by walking more than normal the next day, so my week average was at least 100 percent of my goal. Now that I’ve been hitting my 4,000-step mark pretty consistently for a week, I’m going to go up to 4,500 steps. I’ll keep increasing my goal, probably in 500-step increments, until I get to the activity level where I ultimately want to be. I have a neighbor who is also trying to build up her daily walking habit, so many evenings we go walking together. If one of us is feeling lazy, the phone call from the other is just enough to get us both out the door. And we can push each other to walk just another block or two. I haven’t given myself any sort of treat, but I am definitely noticing how much better I’m feeling now that I’m out walking again. And that’s all the reward I need right now! I also share my success on social media, periodically, because the encouragement from friends feels good and keeps me inspired. Whatever habits you want to build — health-related habits, uncluttering habits, etc. — similar strategies might work for you, helping to ensure you make time in your day for these new habits to take hold. Our dog “Batgirl,” a middle-aged Boston Terrier, has a habit of holding a toy in her mouth as she looks out the window. If someone is walking down the street, she’ll grab a tennis ball and give them a good stare. If a car is parking at the neighbor’s house, she’ll welcome them with a squirrel chew toy and a mild growl. Her behavior is a sign that she’s protecting the family and showing off her favorite goodies in the process. The only problem with her scheme comes when she barks. Inevitably, the tennis ball will fall from her jaws and tumble behind the couch. Mr. Squirrel sometimes suffers a similar fate. So, one of us has to pull out the couch to retrieve those objects, and usually discovers a whole menagerie of lost and forgotten things. The top of the washing machine. We often find little bits and bobs in pockets while doing laundry. Designate a small, portable basket to capture/redistribute these treasures, and then return objects to their proper homes ever couple weeks. Under beds. The classic “out of sight, out of mind” storage solution is a magnet for clutter. Get some low-profile, open containers on wheels to help keep these areas stay organized and useful. The junk drawer. I’ve written about this before. Make an appointment to dig in there every few months or so to keep clutter from getting out of control. That one closet. You know the one. For us, it’s right behind the front door, and houses the vacuum cleaner, a mop, and other cleaning items. The problem is that lone shelf that loves to gather anything and everything. Labeled bins can help organize this space. Your home’s primary entrance. People love to drop shoes, backpacks, umbrellas, and clutter right at the door. Give this potential problem area some TLC once a week. Those are the big offenders here at Chez Caolo. 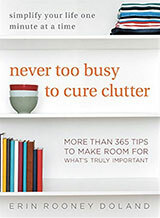 What are the forgotten clutter zones in your home? What’s it like under your kitchen sink? Sound off, and let us know how you keep hidden clutter areas under control. What are considerations re: offering via freecycle vs. donating to charity shop? For those unfamiliar with freecycle groups, they are local online communities whose members offer things to each other, for free. Happy Mum, while you got many good responses from other readers, I thought I’d share a list of questions to ask yourself when making the donate-vs.-freecycle decision. Which method is most meaningful to you? I’m often donating on behalf of clients, some of whom are interested in the tax credit for making a donation. Some are happy to support the charity running the thrift store, too. But others prefer knowing their items are going to someone who can use the item, right now, and they enjoy seeing the thank you notes from freecyclers who get their items. I happen to have a good freecycle group in my neighborhood. (I’m biased, since I’m one of the group owners.) I also have a charity thrift shop very close by, with hours that work well for me. There’s also another charity that does curbside pickups of donations every month or two. But not everyone will have all these choices, and sometimes picking the easiest method is the best. Is it worth a little extra effort to donate to a specific charity? There’s a group in my area called Be a Dear and Donate a Brassiere, where the bras it collects go to women in homeless shelters. I keep a donation bag going and drop it off when I happen to be driving near a drop-off site. My neighborhood also has an annual charity book sale on Labor Day weekend and accepts donations throughout August, so if it’s getting close to August I might set aside books to be donated there. Another example: If you have a functional but unused activity tracker, you might like to send it off to RecycleHealth. What items does the charity shop take? Mine will not take toys, electrical items, large furniture, etc. But it’s a great place to donate clothing and kitchen items such as glassware and serving pieces. What items go well on freecycle? This will be location-dependent, but I know that craft items, non-fiction books, and pet supplies are some of the things that go quickly on my group. Women’s clothes can be challenging to freecycle due to fit issues, so I almost always donate those. Freecycle can be useful for getting rid of things most thrift stores won’t take. For example, my own group has recently found new homes for moving boxes, amaryllis bulbs, cans of coconut water, a frozen turkey, and a console (missing the back panel) with a non-functioning tube radio and a record player. Freecycle is also good for getting rid of bulky items that are hard to move (and often not accepted at charity stores), such as file cabinets and exercise equipment. To find your local freecycle group, simply do an online search for the word freecyle and the name of your city. Freecycle.org lists many groups, but some excellent freecycle groups chose not to be part of this network. For local giveaway alternatives, you can also look into Nextdoor or the free section of craigslist. In the U.K., you might look at Freegle. And in some neighborhoods, just putting something at the curb with a “free” sign is a good way to give things away.